I don’t know about you, but I didn’t bother traveling to the Path of Totality during the recent 2017 eclipse. It wasn’t worth the travel and traffic jams, on top of the risk of having a cloudy day. But for the next North American eclipse, I have a ringside seat… I’ll see it from the sun deck on the roof of my apartment in Mazatlán. 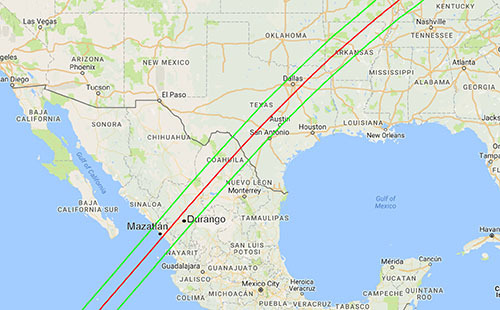 That’s because the Path of Totalityfor the eclipse on April 8, 2024 will completely envelop Mazatlán, and nearby Durango. As you can see below, the path will also cross into Texas and head into the Northeast. But since the United States will be in its April showers season, there’s a good chance you won’t see anything up there. 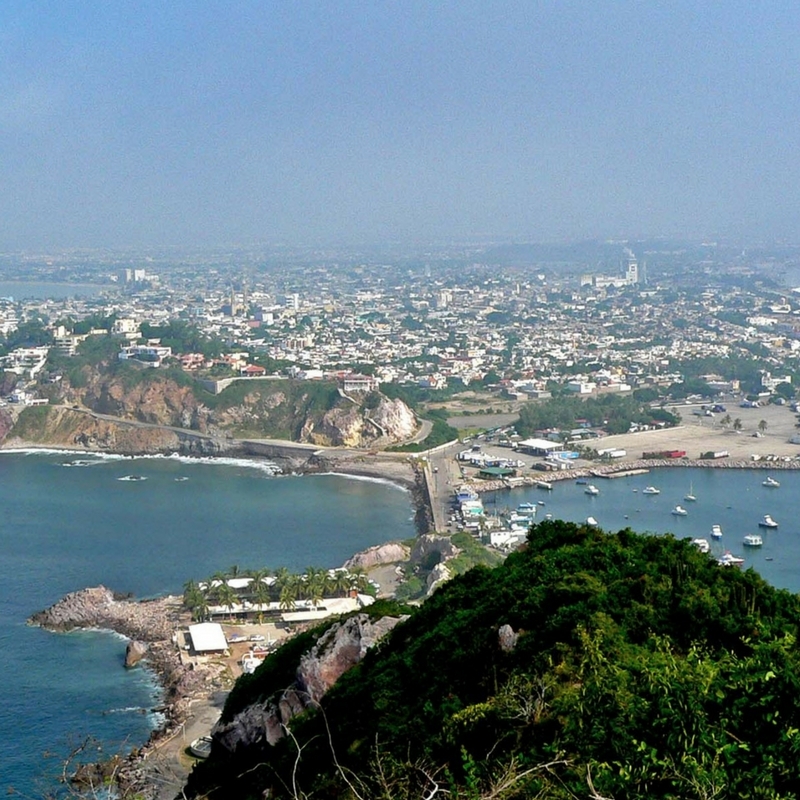 Mazatlán is a resort city, with a well-developed tourist infrastructure. You can be sure it will host the hemisphere’s biggest eclipse party, and plans are already underway. But if you don’t want to enjoy the party, you could rent your property out. Since a four-bedroom rancher in Madras, Oregon was renting for US$10,000 per night (Airbnb), you can be sure of renting your property in Mazatlán for a sufficient sum to cover your ownership expenses for several years to come. There are a lot of options on Mexico’s Pacific coast, but here are a few reasons why I preferred to buy in Mazatlán. It has a large and well-maintained colonial center. 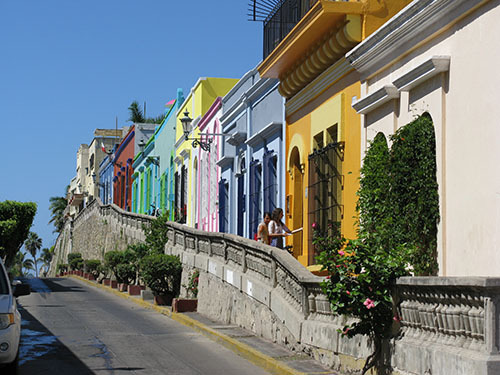 Many colonial centers are just a few blocks of Spanish colonial architecture, but the historic district in Mazatlán is quite large, offering a wide range of price, style, of state of renovation. Lots of fine dining, cafés, clubs, museums, theaters, as well as classical and popular music are available in town, not only in the historic center, but up and down the adjacent beaches areas. 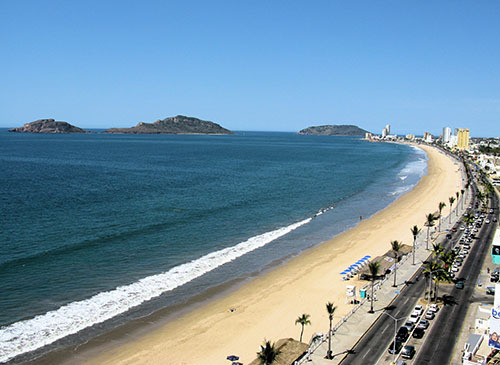 Mazatlán offers almost 20 miles of beautiful beaches. The city boasts mile after mile of well-maintained, sandy beaches with warm, swimmable waters. Much of this beachfront is bordered by a wide, lighted boardwalk, normally busy with people strolling, jogging, or biking. Prices are great. Whether you’re dining out or buying a property, you’ll find prices to be remarkable at today’s favorable exchange rates. The best property bargains are often priced in Mexican pesos or Canadian dollars, but most-all properties are low when compared to other beachfront markets around the world. A good rental market exists in the winter, when North Americans flock to Mazatlán… but it’s also good in the summer, when Mexicans come for their annual vacation. There are plenty of good property managers to keep your place booked and cared for it when you’re not there. Home Depot, Sam’s Club, Walmart, OfficeMax, and company… Mazatlán has an entire city full of local shops, and Mexican supermarkets both large and small. But it’s nice to know you can go to Home Depot or Walmart for some one-stop-shopping if you’re doing a project. You can drive here. The trip from the Arizona border is just one long day or two easy days of driving. If you fly, the flight from Phoenix or LAX is less than two hours. There are two penthouses available, each of about 223 square meters (2,400 square feet), with three bedrooms and three baths. The apartments have a huge private terrace of their own… plus elevator access to the rooftop deck and lounge area one floor above. The asking price is US$375,000 each. For more info, contact the developer, Mike Arnold. Luxury, front-line apartments in the historic center are rare… this is the only building where you’ll find them. Also, I found a rare, two-bedroom beachfront condo for sale, just north of the Golden Zone, in a good residential area. It’s got two baths, and a living area of 105 square meters (1,130 square feet). The property has a private pool, beachfront palapas, and private parking. With ocean, beach and island views, it comes fully-furnished. The asking price is US$199,500. Contact my friend Gregory Derksen via this page for more info on this one. This property has a front-line marina view, so you can not only watch the eclipse, but you can also see the boats bobbing in their slips from your living room. It’s a three-bedroom, three-bath unit of 192 square meters (2,066 square feet). It’s westward facing, so you’ll also have a magnificent sunset view, while you’re watching the boats come and go. The asking price is US$189,000. The apartment comes fully furnished. You can contact Gregg for this one, too. If you’d like to own a colonial home in the historic center, this house is a Mazatlán classic. In fact, it’s on the most photographed street in Mazatlán, a block from my own place… I’ll put the photo below. The house is just over a block from the beach, and it has a rooftop terrace that’s perfect for eclipse-viewing. It’s also within an easy walk to the restaurants, shops and galleries of the historic center. The house has its own private swimming pool—a rarity in Mazatlán’s historic center—surrounded by a lush, tropical garden. With two bedrooms and two baths, the total living area is 211 square meters (2,270 square feet). The asking price is US$425,000. Is A Mazatlán Total Eclipse In Your Future? 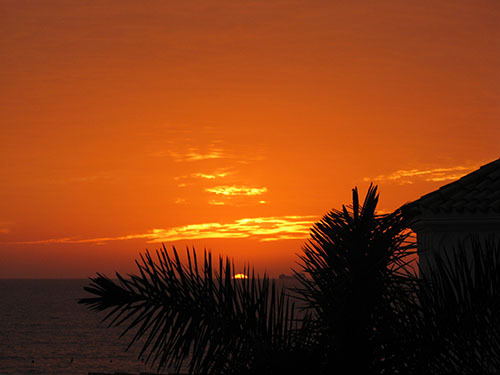 Whether or not you’re interested in eclipse-viewing (or eclipse-renting), you’ll find Mazatlán to be a good choice for seaside living. It’s hot and humid in the summertime… but otherwise, the weather is beautiful. The town hosts a tourist trade all year, which can be bothersome… but the tourist trade also brings plenty of amenities, restaurants, and opportunities for rentals. If you’d like a pleasant place to spend the winter—with an active rental market in the summer—then Mazatlán could be just right for you. I am eyeing my retirement future outside the USA. I think Mexico has something to offer, partially based on proximity to the USA and time zone concerns. My question is regarding the price of real estate today in Mexico. It is not clear to me if the devalued peso offers any price advantage to a buyer with U.S. dollars. Has real estate become more affordable due to the peso devaluation or are these types of properties priced in dollars, and thus continue to remain expensive? I am interested in any city with a beach and access to good health care. Mazatlán, Puerto Vallarta, or Los Cabos would fit my needs. How about locations inland, such as Puebla or Cuernavaca? Any other location advice is appreciated. Properties in Mexico are priced in one of three ways. Some are priced in U.S. dollars. Some are priced in Mexican pesos. And some are priced in dollars, then converted to pesos periodically to make you think you’re getting a good deal from the exchange rate. Of those three, only the genuine peso-priced properties will go down in price—in dollar terms—when the dollar gets stronger. Mazatlán has a mixture of peso-priced properties and dollar properties, since it’s popular with Mexican buyers and sellers. But generally, most resort area properties will be based in dollars. Your suggestion to look in the interior is a good one. In my experience, Puebla and Cuernavaca have plenty of peso-priced properties, which will give you an advantage at today’s exchange rates. And remember, whether your property is priced in dollars, pesos, or bogus pesos, all of your other living costs will be lower with a strong dollar… everything from dinner out, to a good bottle of wine, to a trip around the country. Do you have any information about places where one could park a tiny house in Mexico? Any restrictions you might know about? I am considering building a tiny house and traveling to Mexico with it if I can park it legally. Unlike much of Latin America, Mexico is fairly well-outfitted with RV parks, and even campgrounds. So while you’re in transit, you should be OK if you call or write ahead. Once you’re there, it’s sometimes possible to stay in RV parks or campgrounds long-term. Some people park their tiny house behind someone else’s house or on a corner of their property, in exchange for money or some other consideration. Finding a Mexican family who would want the extra income may not prove too difficult. You could also consider leasing a piece of land to park it on, assuming you don’t want to buy a piece of land. We met at an event in Quito 2011, and I have a question or two to ask of you. First, what do you think of Manta, on coastal Ecuador? Salinas, if I remember, has a bad reputation for its weather. Is it the same thing for Manta? Also, I heard that the Ecuadorian government charges a gringo resident tax every quarter. Is this true? If so how much? Ecuador has what I call a grey season on the coast. Roughly between May and Nov, it’s usually overcast… thanks to the chilly Peru current offshore. When I’ve checked with local agents, they usually tell me that theirs is the only coastal spot where it remains sunny… and that the day of my visit is the first overcast day of the season. For what it’s worth, in my somewhat limited Manta experience, it has indeed been sunnier during the overcast season. The same holds true for Playas, which is located on a bay that’s farther removed from the current. As to the gringo tax, no… there’s no quarterly gringo tax. What you may have heard of is a financial transactions tax, on large, outbound wire transfers from Ecuador. Many of these transfers are from North Americans selling homes, so it may have been mislabeled a “gringo tax”.